Water-based gutta with a pearlescent effect (except black and clear). 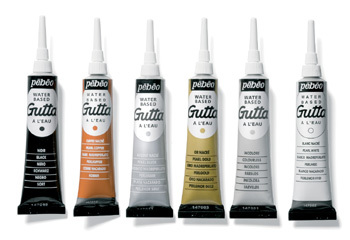 Use the gutta direct from the tube. Iron-fix before washing, except for the clear gutta which can be washed out after fixing. Use the Javana nib for a finer line - you will need to cut the tip off the nozzle first, and then screw the nib on.